What happens if we don't make money in a business? We might let it run for sometime but at the end, if things don't change, we will ended up closing it. These days the price of gold is around 1200 USD/ounce, it could be 1100 or 1300, but more or less this level. 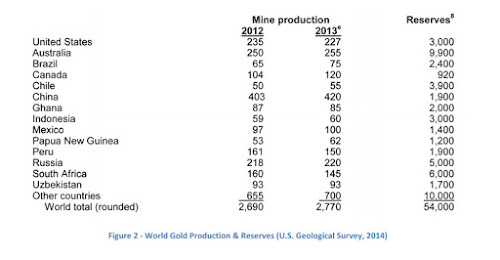 And we wonder what is the real price of producing gold (with taxes, energy, environmental costs...). In February 2014, the World Gold Council noted that the average industry cost of production is $1,200/ounce, with 30% of the industry becoming unprofitable if the gold price drops below that level (Rudarakanchana, 2014). Barclay’s commodities research provides similar figures. Their report from 2013 shows that the marginal cost of production was $1,104/ounce (Barclays Commodities Research, 2013). Recently it's been calculated the total cost of production of some mining companies: Randgold 1000, Newmont 1200, Barrick and Goldcorp 1500, Iamgold 1700 and Kinross 1800. With the present price, most of them are losing money. If some close, there will be less offer and prices will soar. On the other hand, the gold reserves are not going to be there forever. As we can see on the chart above, in 20 years (plus the extension for the new found gold) we will almost run out of gold and we will only be able to rely on recycling. Another push up.